India evidently used up all their runs in the First ODI against the West Indies, as they only managed 188 at the same ground as they slumped to defeat in the second match. Of the 188, 95 were made by Dhoni, sharing a century partnership with RP Singh to rescue the tourists from the depths of 82/8. For the hosts, the bowlers ran riot, with Ravi Rampaul’s 4-37 doing a large chunk of the damage. Chasing down such a meagre total was child’s play for the Windies, with the tourists cruising to victory with nearly 16 full overs to spare. 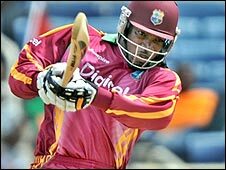 Runako Morton made 85 not out and Gayle blasted 64 from 46 balls as the hosts levelled the series at the halfway stage with surprising ease. The best and worst of India has been on display already in this series, and it is only two matches old. Meanwhile, the West Indian bowlers may just be starting to get going. India’s squad for their upcoming tour of the Caribbean makes interesting reading. In the absence of Sehwag and Raina (injured), Tendulkar and Zaheer (rested), and Munaf Patel and Irfan Pathan (dropped), there are one or two names that require a little mental exploration before recognition is achieved. Ashish Nehra hasn’t played for India since 2005, and Abhishek Nayar, is, I must confess, a mystery to me – although he has made an impression on some, and his 99 in the Ranji Trophy final (as well as his IPL experience) marks him out as someone to keep any eye out for. Ravindra Jadeja is also a relative newcomer to the full Indian side, having only played a single ODI, but he has impressed in the past for the Under-19 side, and featured in the World Twenty20 side. The squad in full is as follows: MS Dhoni, Yuvraj Singh, Gautam Gambhir, Rohit Sharma, Harbhajan Singh, Pragyan Ojha, Yusuf Pathan, Murali Vijay, Subramaniam Badrinath, RP Singh, Praveen Kumar, Ishant Sharma, Abhishek Nayar, Ashish Nehra, Ravindra Jadeja, Dinesh Karthik. India, the defending champions, will face high expectations after emerging triumphant from the thrilling finale last time out. The intervening years have of course seen the development of the Indian Premier League, a competition that means India’s players have a wealth of Twenty20 experience (although the national side has only played five T20 Internationals since the last competition, winning only one). Twenty20 superstars such as MS Dhoni and Yuvraj Singh will certainly strengthen the holders’ chances of retaining the title. Bangladesh caused a minor shock last time out when they beat the West Indies to make the Super Eight, and hopes will be high that they can reach that stage again. The likes of Tamim Iqbal, Mohammad Ashraful and Shakib Al Hasan are potential match-winners, but no Bangladeshi player has yet set the IPL alight, and any progression beyond the last eight seems unlikely for the Tigers. Ireland qualified for the tournament mainly thanks to an impressive performance from Andre Botha. The side will, however, be missing a key player of recent years in Eoin Morgan, who has been called into England’s squad for the tournament. A surprise result against Bangladesh could see the Irish sneak into the Super Eight (much as they did in the last 50-over World Cup), but on balance the current side (especially without Morgan) may be hard-pressed to repeat the heroics of 2007.